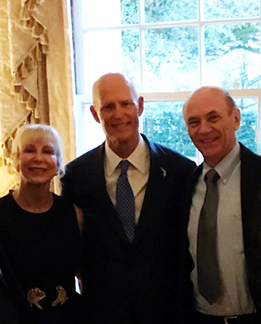 Tom Mortenson, STA President attended a reception hosted by Florida Governor Rick Scott and First Lady Ann Scott honoring Consul Generals and Honorary Consuls in Florida. The reception was held at the Florida Governor’s Mansion and brought together foreign leaders who facilitate trade between the United States, and other countries. Tom is also 1st Vice-President of the Tampa Bay International Business Council, made up of various chamber and trade associations. “International trade and foreign-direct investment accounted for about one-sixth of the state’s economic output last year and supports an estimated one million jobs in Florida. Trade and investment is extremely important to the Florida economy and Governor Scott’s job creation objectives for the state” Mortenson said in quoting statistics from Enterprise Florida.